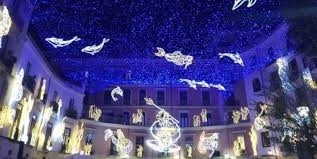 In the nearby Salerno, a few kilometers from Palazzo Suriano in Vietri sul Mare (in the Amalfi Coast), from November 9, 2018 to January 20, 2019 there will be "LUCI D'ARTISTA", the traditional event that sees the striking bright works in the city. Also planned the Christmas markets, the Ferris wheel, concerts and events during the period. You can stay in the elegant and relaxing atmosphere of Palazzo Suriano in Vietri sul Mare and from here visit the Luci d'artista of Salerno, taking advantage of a special package with transfer to Salerno and return. Each package includes STAY + 1 TRANSFER. The transfer, during the stay, is included in the package and includes the outward journey, at times and arrangements to be agreed, from Palazzo Suriano in Vietri sul Mare to Salerno (and the relative return) to visit the Luci d'artista and the city (private guide not included). The offer applies from 12.11.2018 to 20.01.2019 (the periods from 7 to 9.12.2018 and from 22.12.2018 to 27.12.2018 are not included). The offer is subject to availability and only applies to bookings made by direct booking from the Palazzo Suriano website. The transfer from / to Salerno is scheduled at times to be agreed at the time of booking, subject to confirmation by the Management of Palazzo Suriano and the company / agency that will make the transfer. - GUIDED TOUR to Luci d'artista and monuments of Salerno (historic center, Duomo, places of the ancient Salernitan Medical School. - During the stay, it is possible to organize transfers, with or without a guided tour, also on the Amalfi Coast (Amalfi, Ravello, Positano and other places), to the excavations of Pompeii, Ercolano and Paestum, to Naples or to the many monuments and places of interest, naturalistic, artistic and historical in Campania (Certosa di Padula, Royal Palace of Caserta, excursion on Vesuvius, Capri). On www.campaniameteo.it you can find the real-time weather conditions of Salerno and the province, as well as of the entire Campania region, weather forecast, live webcam and all the main events that take place in Campania and in the province of Salerno.